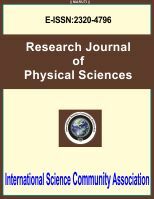 International Science Community Association are publishing an international peer reviewed journal Research Journal of Physical Sciences . It is the vision of International Science Community Association to publish research papers, research articles, review papers, mini review, case study and short commutations in all areas of human study without financial restriction. Coverage Area: Researches in the field of Physical Sciences which including classical and applied physics, atomic and molecular physics, nuclear physics, statistical and quantum mechanics, mathematical and chemical physics, biophysics and geophysics, semiconductor and metals fluid, dielectrics and ferroelectrics, surface science, earth science, thermodynamics and nonlinear systems, wireless and optical communications, crystallography and computer-aided materials design, etc.